Manager Mick Harford admitted that the second half against Charlton was the ‘worst performance’ he’s seen from his Luton side as they conceded three goals to see their six-month unbeaten run in League One come to a crashing end on Saturday. Town had finished the first half one goal up after Harry Cornick’s 15th minute pearler, but the Addicks’ front pair of Lyle Taylor and Igor Vetokele ran riot after the interval. A brace for Taylor either side of Vetokele’s strike – which was the first of two in as many minutes – ended a 28-game unbeaten streak. Harford, who took charge of the team in January, said: “The second half was probably our worst performance, in terms of possession. "That’s what we’re about. We like to keep that ball. We don’t like to go long. Top scorer and EFL League One Player of the Season, James Collins, was missing through suspension and Harry Cornick made his first start since December 29, bagging his first goal since Boxing Day as Luton took the lead. But they couldn’t capitalise on some promising play in the first period to force a second, with Addicks keeper Dillon Phillips pulling off a stunning save from George Moncur. After the half time interval Luton rarely got out of their own half and despite Cornick and Elliot Lee both being replaced, with Brighton striking loanee Aaron Connolly coming on for his debut, there was little change in that pattern. Harford added: “We lacked a bit of presence up top in terms of the personnel we could play, with the injury list, but we asked them to play a certain way. It was the first time Town have come away from a third-tier tussle with nothing since October’s defeat at second-placed Barnsley and it saw their lead at the top of the league cut to five points, with 12 to play for. It was the end of a remarkable run which saw the Hatters break three records and equal another and Harford said: “We didn’t want it to come to an end, especially in the fashion it did. "In the first half I thought we started very passive but after 10-15 minutes, we got ahead and should have gone further ahead in terms of possession, chances and the way we played in the first half. 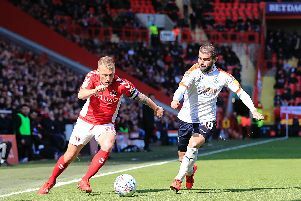 The Hatters were also missing Danny Hylton, Kazenga LuaLua, Alan McCormack and Dan Potts through injury, while top scorer James Collins was suspended, but Harford also ruled out that as an excuse for the 3-1 reverse at The Valley. “We’ve got a bit of a long injury list but it’s absolutely no excuse,” he said, adding: “We thought we could come here with the team we had, put on a good show and beat Charlton. “In all fairness, if we’d gotten a bigger lead we would’ve done.